Video game publisher Ubisoft announced it will be donating €500,000, or about $564,775, to help with rebuilding the Notre-Dame Cathedral following a fire that ravaged the historic monument earlier this week. In addition, the company said Assassin’s Creed Unity, which features a recreation of the Cathedral, will be free to download on PC for the next week. The company’s donation will go toward a rebuilding fund that has already reached $1 billion in combined pledges. France’s President, Emmanuel Macron, has vowed that the restoration effort will be completed within the next five years, though some experts suggest it could take longer. A handout image provided by Brigade de sapeurs-pompiers de Paris in which firefighters battle the blaze at Notre-Dame Cathedral on April 15, 2019 in Paris, France. Part of that rebuilding effort will likely entail referencing existing repositories of measurements and digital photographs of the Cathedral, the original construction of which began back in 1163. 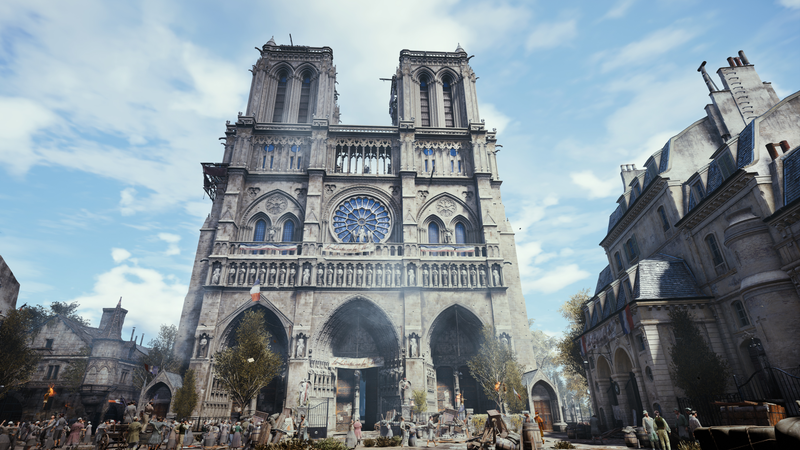 Given the intense, two-year long effort to recreate the Cathedral in Assassin’s Creed Unity, a game which largely takes place in 18th-century Paris, there’s been speculation that it could be used to aid in the restoration effort. The Cathedral appears proportionally 1:1 with its real-world counterpart, and is arguably one of the most sweeping and detailed buildings to ever appear in game. For now, anyone interested in exploring the Cathedral untouched by this week’s fire through Ubisoft’s artistic lense can do so by downloading Unity from the company’s website.